Objective: The client wanted to create an Home Owner Association private informational website to showcase the community, events, and have a private members section. Tatem Web Design created an expandable Joomla CMS content management system to be able to encompass the many needs of the HOA offered. The client supplied the logo and the company colors to create the website. The Joomla CMS system is fully expandable to add additional pages and pictures of the docks, and HOA community. Tatem Web Design added a full featured events calendar for managing community events. 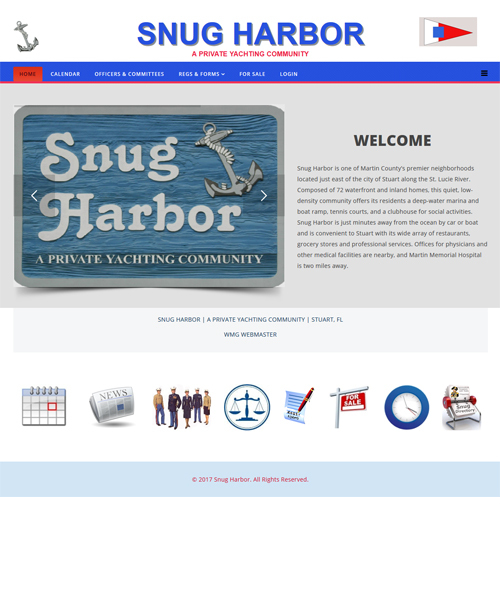 Tatem Web Design built a new website design for Snug Harbor Yacht Clubs HOA so that they could manage and update the content of his website on their own. We provided the training and support and the client can do updates when ever they need to make changes on the website. The website was developed in Joomla and has many features such as members, online calendar of events, and much more. The new Snug Harbor website design was done as their old website was not mobile friendly or responsive in design. The new Joomla website is fully responsive and mobile friendly. We provided full training to their staff so they could update their website, and keep content to the website fresh.